Company directors in Spain are older, and boards are larger and less diverse than the European average. The biggest groups have been run by the same bosses for over a decade. Change isn´t likely to come from within. It’s up to investors to demand a governance shakeup. 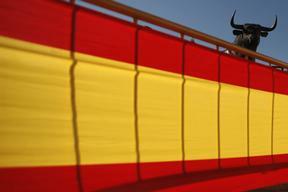 A statue of a bull is seen next to a Spanish flag hung on a fence. Spain´s stock market regulator is revamping the corporate governance code with the help of a committee of experts. The government is also making changes to company law to improve governance which are expected to be approved by the Cabinet on May 23, and then to be submitted to Parliament.